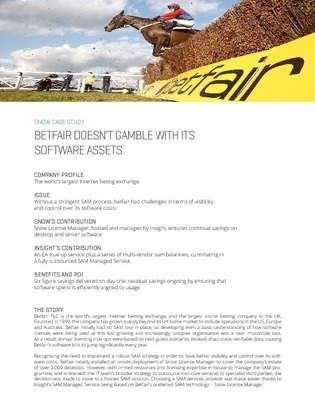 Betfair, the world’s largest online betting exchange, spent many years without a Software Asset Management (SAM) tool, making it near impossible to see where and how their many software licenses were being used in this rapidly growing organization. Annual licensing fees and software vendor audit fees began to take a toll. If this sounds anything like your organization, read through this quick case study on the SAM solution Betfair chose to reduce their Microsoft software expenditure by six figures, and how a similar solution may look in your organization.